When just six corporations dominate the world’s seed, pesticide and biotech industries, they control the fate of food and farming. 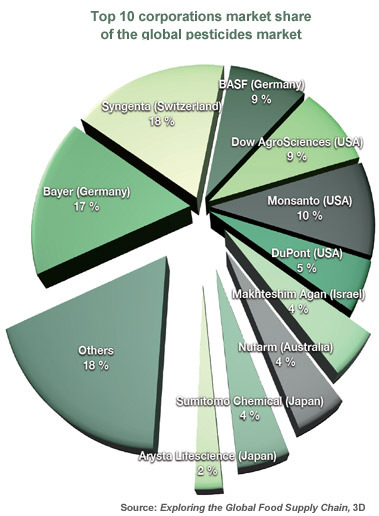 Between them, the "Big 6" — Monsanto, Dow, BASF, Bayer, Syngenta and DuPont — have historically unprecedented power over world agriculture, enabling them to control the agricultural research agenda, heavily influence trade and agricultural agreements and subvert market competition. Along the way, the Big 6 intimidate, impoverish and disempower farmers, and undermine food security, all while making historic profits — even as their genetically engineered seeds fail to deliver as promised. Contrary to what Big 6 marketing campaigns say, these corporations are in the game of expanding their marketshare. Period. With the introduction of genetically engineered (GE) crops, the pesticide treadmill has shifted into high gear. Patented GE seeds are designed for use with specific pesticides, leading to increased use of these chemicals. And widespread application of these pesticides leads to the emergence of herbicide-resistant “superweeds,” among other things. Industry’s latest answer to this problem? More GE seeds, engineered to be used with even more drift-prone and dangerous chemicals. Since the mass introduction of pesticides into food and agriculture following WWII, control over the knowledge needed to grow food has been shifting from farmers to the laboratories financed by multinational corporations. As a result, scientific research that serves corporate interests, rather than the public good, has become the norm. The importance of science for the public good is difficult to overstate — especially when it comes to feeding our world. And then, the “Big 6” biotech and pesticide corporations — Monsanto, Dow, DuPont, Bayer, BASF and Syngenta — conduct focused, well-financed research, lobby decisionmakers and launch PR efforts to ensure that these products come to market — regardless of their efficacy or safety. These drift-prone chemicals are often linked to health harms. The World Health Organization recently completed an assessment of independent studies and determined that glyphosate is a “probable human carcinogen.” And 2,4-D — the herbicide mixed with glyphosate in Dow’s recently approved “Enlist Duo” formulation — is a suspected endocrine disruptor that has been linked to cancer and reproductive harm. Children are particularly susceptible to its effects. In 2014, the agricultural input industry alone spent $30 million on lobbying. Monsanto and Biotechnology Industry Organization spent over $12 million combined. Public concern about and opposition to pesticides and GE crops has grown tremendously in recent years — and the Big 6 have taken note.